Last week we began to examine one of the most significant MMOs in history: Meridian 59. While it never rose to the level of fame and subscriber numbers as its successors did, Meridian 59 was a daring pioneer that paved the way for all that followed. Its story is almost like a movie, with the title born from the fruits of two amateur programmers, surviving studio shutdowns and huge competition, and persevering from 1996 through today. 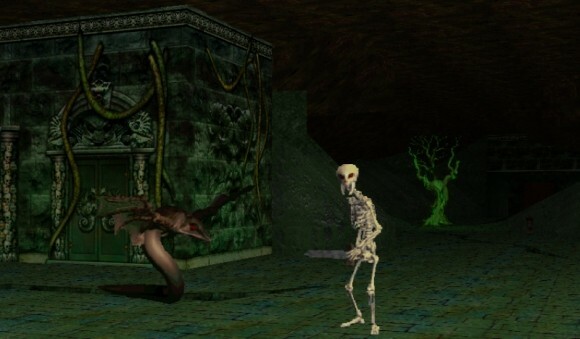 As I'll recount over the next two episodes of The Game Archaeologist, I sat down with Brian Green, a blogger and game developer who oversaw the resurrection of Meridian 59 in the early 2000s and ran it for the better part of a decade. Green graciously agreed to participate, saying that he always loves talking about games -- and this one in particular. The Game Archaeologist: Hi! Please introduce yourself and your current position and project. Brian Green: I'm Brian "Psychochild" Green, a long-time MMO designer and programmer. I'm known for my professional blog and my work on Meridian 59. I'm currently working on the Storybricks project as the MMO Wizard. We're a startup, so that means I do whatever needs to be done at the moment. Where does the handle "Psychochild" come from? I started playing text MUDs (the predecessors to MMORPGs) in college. I was playing a notorious PvP game called Genocide and wanted a hard-to-type name. Back in the dorms, one guy I played Street Fighter with called me "you psycho child" when I'd give a victory whoop, so I used that. The name stuck. I've kept using it because my given name is so common. It's funny how many people I've been introduced to only to have them recognize me when I mention my pseudonym. You said that you have a long history with playing MUDs -- can you elaborate on that? What was your first? Your favorite? I started playing them in college. I was often doing my Computer Science homework late night in the computer lab, letting a program compile in the background (back when it took a while for even a simple program to compile) and played a text MUD while waiting. Of course, my compiling was often done well before I went back to check on it! The first I played was a game called Highlands, hosted on the same machine as Genocide, which was an LP-style MUD. Many early MUDs promoted users to "wizard" and give them the ability to code adjustments to the game. In many games, this resulted in a mish-mash of areas, equipment, and even character classes based on different inspirations. For a long time my character class was a "Lord," which came from the Thomas Covenant series by Stephen R. Donaldson; there was also a whole area based on that book (copyright violation, hurrah!). Another guild was the Terminators -- based on the movie -- and you had to defeat a very tough boss (required multiple people) before you could go in and join. Other areas in the game were based on things like Street Fighter. Even the game was loosely based on the Highlander movies; if your character died you'd leave behind a head; there was no end to the juvenile humor surrounding going up to someone and typing the legitimate command "give head." Funny story: I originally used the name "Rogue" instead of "Psychochild," but there were several problems with that. First, it was super-common; second, people thought my character was female and based on the X-Men character; and third, there was a character on Genocide who used that name and had a rather abusive reputation! People would log on Highlands and give me a screen full of invective about this character's behavior, only to sheepishly apologize when I explained I was not that character. Later I played the game Kerovnia; I was brought there by a friend who played Highlands. I stuck with the game and over a marathon Christmastime play session got up to maximum level and got wizard access. It really opened my eyes as a game designer, and I spent a lot of time coding. In fact, I think the only reason I passed my early morning C++ class is because I was learning LPC at the same time! To this day, I'm still not certain I didn't put "this_player()->" (a common LPC bit of code) on the final for the class! Two things stick out for me. The first was when I realized I was talking in real-time to someone in England. He was explaining how the Thieves' Guild code worked and mentioned it took into consideration your "wedge." I asked what that meant, and he explained it was slang for money. At the time, it blew my mind. The other thing that struck me was the ability to create a world that others participate in. I dabbled in tabletop RPGs (and got into them seriously at university) and loved fantasy literature, so I was familiar with creating a world. But the thought of having masses of people all sharing the world was extra exciting to me. So the ability to talk to others you wouldn't normally and the ability to create and/or explore a whole new world (Socializer and Explorer, for those of you marking your Bartle test score card at home) really appealed to me. How did you first get involved with Meridian 59? Right before I graduated from college, a game company came through the placement office and was looking to hire game programmers. I realized, "Oh, people get paid to make games!" and it planted the seed. Sadly, I hadn't taken very many appropriate programming classes; most were focused on business programming, and I'm not even sure there was a class on graphics programming. I was put in touch with the designers on a project at the company and talked to them, but then I saw the reality of game development. The designer I was talking to had gotten busy (was crunching), then afterward was let go from the company! I was put in touch with a new designer but had to start at square one. I now realize I was chasing that mythical entry-level designer position and should have been amazed I got as far as I did. After graduation, I ended up working at a soul-destroying corporate job where I practically envied Dilbert. But the seed had been planted, and I worked to figure out a way to get into the game industry. I ended up getting in touch with a recruiter who saw some potential and put my name for an N64 programming position at 3DO. Just so happens that my resume passed by the desk of the producer for Meridian 59, and that team needed a new programmer. My background in MUD coding was a strong point. What were some of your responsibilities on the team? I was hired as a Software Engineer, but the team was small and roles weren't very strict. I had a hand in design, worked with the customer service reps, helped with events in the game... I did a bit of everything except art. It kinda set the tone for me later; I still don't fit into a neat category for most of my work. What was the atmosphere and team like back in the 3DO days? Did any of you fully understand the implications of being pioneers in the MMO field? It was a very small team with big ambition. We were insanely dedicated to the game and wanted to do great things. There wasn't much to compare our work to, so it was scary and exciting in equal measures. I think there was some idea what we were doing was special, but I don't believe any of us had that as an original goal. We just wanted to work on a cool game for the players. Do you ever wonder "what if" Meridian 59 got picked up by a different studio, or did something different at the start to have made it much more successful than it became? Hrm, good question. I think that 3DO didn't truly realize what it had on its hands. At the time of the acquisition, it was primarily a hardware (console) company that did some game development and was transitioning over to game development. It obviously had some success as a single-player game developer, but I think it really didn't "get" the strength of online games. It tried to treat Meridian 59 like a single-player title, particularly in marketing. Hard to say if another company would have understood better, as online games were a really new phenomenon. Even EA/Origin says it didn't anticipate the success it had with Ultima Online, which came out a year after Meridian 59. Closing an MMO is always a terribly sad event. How did the team and community react to the 2000 shutdown? One of the motivations for shutting the game down was that there were no developers left at 3DO who had a complete knowledge of how the game ran. I was the last person who had worked on Meridian 59 full-time, and I left in early 2000 to work at another company after having been taken off Meridian 59. I had heard that the motivation was to choose to shut the game down gracefully rather than having a technical problem suddenly bring it down. So there was really no team at 3DO anymore to lament it. However, some of us developers did log on the last day. I took the day off from my job at the time to spend one last day with the game. A few other developers got on and we sent the game off in fitting fashion. The players were disappointed for the most part, but I think by this time they had seen the writing on the wall. The game had not been patched or updated in many months before the announcement was made, so I don't think it was a complete surprise to many people, although nobody was eager to see the game close. Why did you want to help resurrect M59? Was the name of Near Death Studios intended to be a tongue-in-cheek reference to its former fate? Well, I loved the game and wanted to bring it back, especially for the fans. I thought the game had a lot of unique features that should have become established parts of MMOs. Near Death Studios was actually formed well before we bought Meridian 59. A former M59 developer, Rob "Q" Ellis II, had founded the company with a third co-founder. The name came from near death experiences of two of the co-founders in vehicles; my story involved driving over a 200-foot cliff that could have dumped us into a river. We were intending to build our own game, but Rob had emailed 3DO asking if the folks there would be interested in selling the game after closing it down. They decided to sell to us, so we put our previous plans on hold and borrowed money to acquire the game from 3DO. Why resurrect an MMO instead of starting a new one from scratch? As I said, we intended to make our own game. We were developing technology and were going to start designing out the game. It was intended to be about the same scale as M59 initially. But when we got the opportunity to acquire M59 and resurrect it, we took it. We intended to study the source for the game to improve our own technology and use income from running M59 to fund development. At least, that was the goal. We ended up just focusing on Meridian 59 to the exclusion of other projects. That's all the time we have this week -- stay tuned as we conclude this interview in style in the next column! We're thinking fireworks and hot apple cider. Sound good?